Diagnosed with depression at the early age of 9-years old, mental health has been something I’ve had to take very seriously. 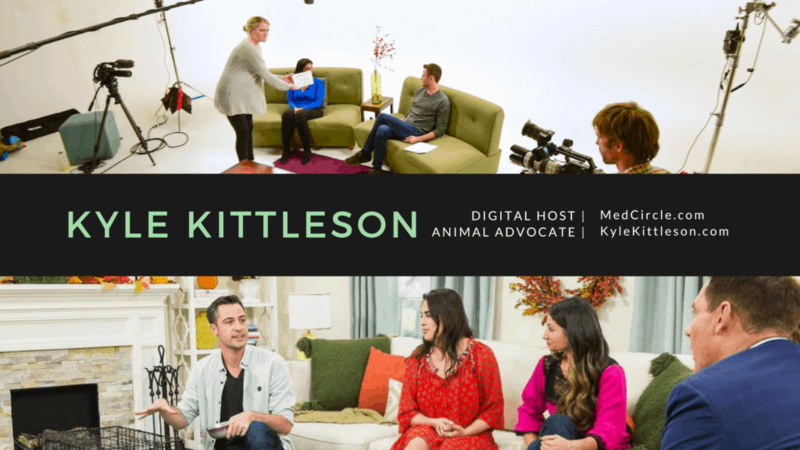 When I was met with the opportunity to become the on-camera Digital Host for the mental health education company, MedCircle.com, I knew it would be a perfect fit. Filming the MedCircle series on Narcissistic Personality Disorder. Interviewing the world’s best mental health experts and most sought-after mental health survivors is an honor and a privilege. These impactful series help millions understand mental health conditions and possible next steps. You can learn more about MedCircle.com and becoming a member by clicking here. One way I was able to thrive, despite my constant struggle with depressive thoughts and symptoms, was to become an influential animal advocate and behaviourist. 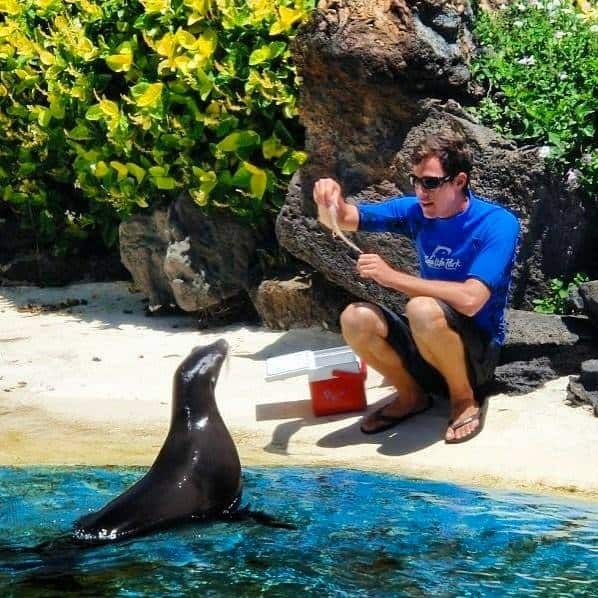 Feeding a sea lion pup some squid! From an early age, I knew I wanted to work with animals. I developed a strong passion for marine mammals by the time I was six. I dreamt of spending my days working with these incredible creatures. With a little bit of luck, a lot of hard work, and a never-ending drive to succeed, I accomplished my dream and spent my adult life working with animals. I have worked all across the United States and have experience in animal care, rescue, rehabilitation, and training. All of my training is based on operant conditioning and positive reinforcement. You can’t (and shouldn’t) force an animal to do anything. The best relationships I’ve had in my life have been with animals. Animals are the reason I wake up in the morning and they should be treated with respect. In addition to killer whales, I have worked with a variety of exotic birds, penguins, harbor seals, Hawaiian monk seals, California sea lions, Atlantic and Pacific Bottlenose dolphins, false killer whales, and pilot whales. My dog Callie and I taking a break on-set! For three years, I owned and operated my dog training company, Pinky’s Dog Training: We Make ‘Sit’ Happen. By cultivating a team of talented canine trainers, we were able to help hundreds of families establish lasting relationships with their pets. At the end of the day, we never really trained the dog — we trained the people! Currently, I am a canine behavior consultant for Tully’s Training, a premier dog training company in Los Angeles. I also offer online resources for dog owners, such as; Street Safe Dog: Keeping Your Dog Out Of The Street. 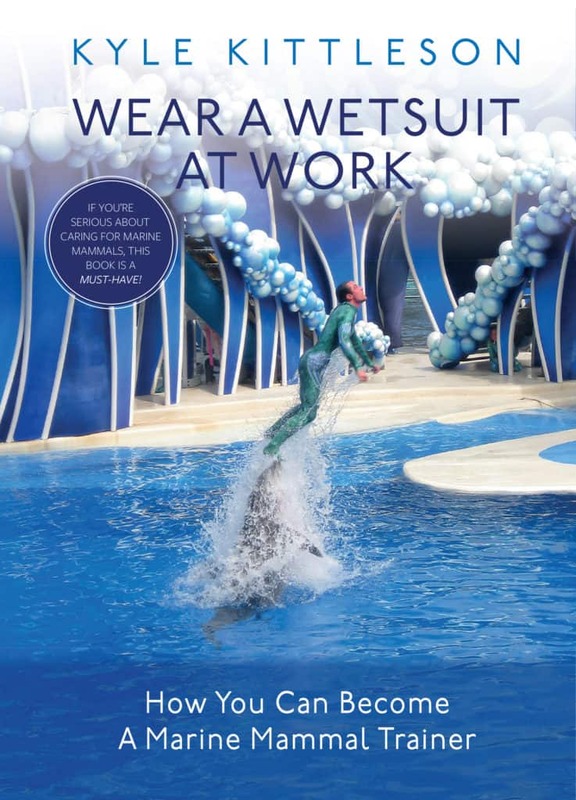 My first book, Wear a Wetsuit at Work: How You Can Become a Marine Mammal Trainer, is a fully comprehensive and most up to date resource for aspiring marine mammal care professionals. It is available as an eBook or paperback. I spent five years compiling the definitive guide to becoming a marine mammal care professional. In the book, I not only share what aspiring trainers should do to prepare for their career, but I also share personal stories of how I was able to enter and excel in this competitive industry. From rescue and release to training and care – this book has it all. I also authored my free eBook, 5 Tips to a Better, Well-Behaved Dog. The book will take you ten minutes to read and ten minutes to see results with your dog. 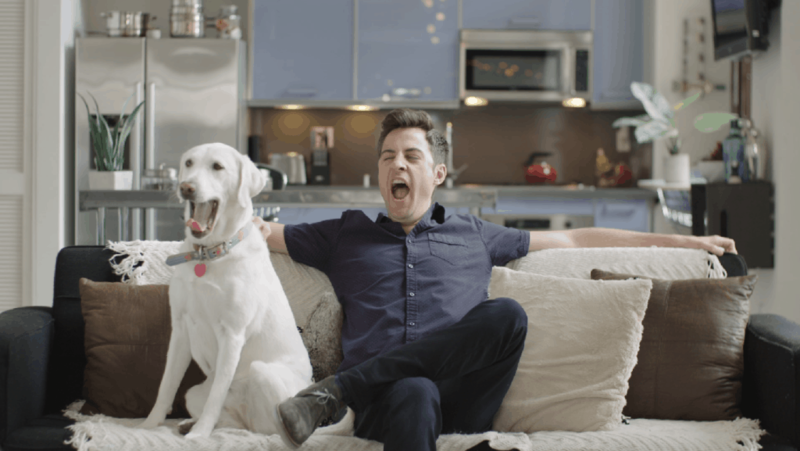 You should have a wonderful relationship with your dog. This book will make it happen. This book is free for students enrolled in the Street Safe Dog Online Course. I also enjoy helping aspiring trainers reach their personal dreams through my website: MarineMammalTrainer.com. Like mental health, my passion for animals comes with a passion to spread education, conservation, and most importantly, action to the entire world. In the early days of my animal-centered career, I would perform with these amazing creatures three to five times a day in front of thousands of people. I knew those performances inspired all who watched. It was during those performances that inspired me to pursue a career in television. Why? Because why inspire thousands in person when you can inspire millions through television and digital media? With countless television and radio appearances, I have been able to share my message of animal care and animal advocacy with millions. This has also given me an amazing online following who are passionate about the natural world we share. With this exposure, I have been asked to host a variety of different projects; including being the spokesperson for Jeep Renegade and Honda while also hosting the red carpet at tv and movie premiers around Los Angeles. Please take some time to check out my resume and feel free to contact me anytime.